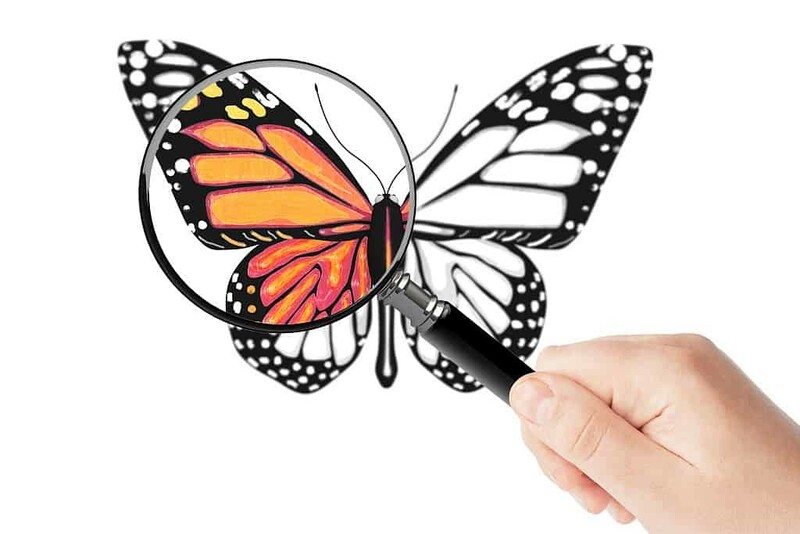 Butterfly Science activities for preschoolers through second grade. As we are observing real caterpillars going through their stages of development (metamorphosis), we are creating a butterfly life cycle tree in our classroom. We got some big sturdy branches with no leaves (see if someone needs to prune dead branches from their tree), put it in a 5-gallon bucket full of sand and began to create the cycle. This process took several days and was in conjunction with our learning of the cycle. First, we cut out green construction paper leaves and attached them on to the branches. The kids then glued on caterpillar eggs (cotton balls) to the underside of the leaves (so the birds can’t find them!). Then we made the classic egg carton caterpillars and attached them on to the tree. We used brown coffee filters to twist into shape and make chrysalides and attached them to the leaves. Finally, we made SYMMETRICAL butterfly cutouts and attached them to the tree as well. What a sight! The kids were really able to articulate the life cycle process! Have the children glue small pompoms on an old-fashioned clothespin. Then have the children put them in a small paper bag which would be the cocoon. The children leave the “cocoons” at school overnight. At circle time, talk about how caterpillars turn into butterflies. Tell the children that in the morning when they come back to school their caterpillars might be butterflies. After class, glue pre-cut wings to each child’s caterpillar and return to the bag. The children love it and it is a great visual for learning. Day 2: put your caterpillars in a cocoon. Paint the outside of a toilet paper tube with watered down glue, cover with brown or green tissue paper. Cover one end, place caterpillar inside, cover another end. Day 3: (or what a few days to enjoy those cocoons) make wings for your butterfly. I like to color the coffee filters and spray with water then dry. Poke your cocoons open and make your butterfly. The kids really enjoyed this hands-on way of learning the butterfly life cycle! We ordered caterpillars from Insect Lore online store, http://www.insectlore.com, and are eagerly awaiting the metamorphosis that will soon take place. I read this on another, sharing site. I thought it was wonderful and worth sharing with all. Using macaroni for a butterflies life cycle. Put it all on a paper plate divided into 4 parts. For eggs-use rice, caterpillar-use spiral, cocoon-use shell, butterfly-use bowtie.